Although we have been prototyping various parts of Godkin since about a year ago, we didn’t tie down most of the details until around June this year. Since then, there’s been a big push on to get the game up to a demonstrable state for Galway Games Gathering (this weekend). 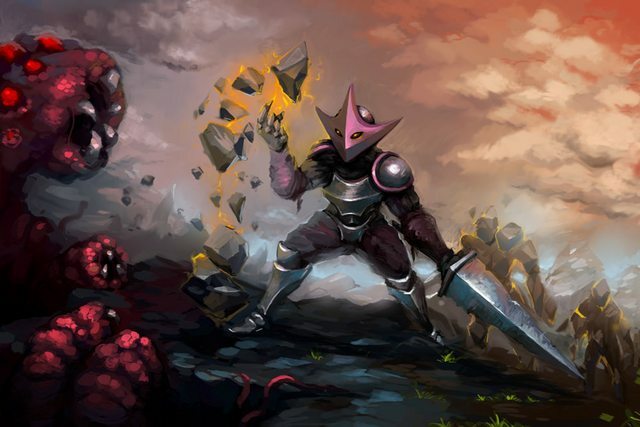 The core of Godkin is an online party-based combat RPG, where you play as demi-gods defending procedurally-generated mortal realms that are being invaded by hordes of monsters. As you gain experience, you will learn spells which are aligned with one of 10 different elemental gods. 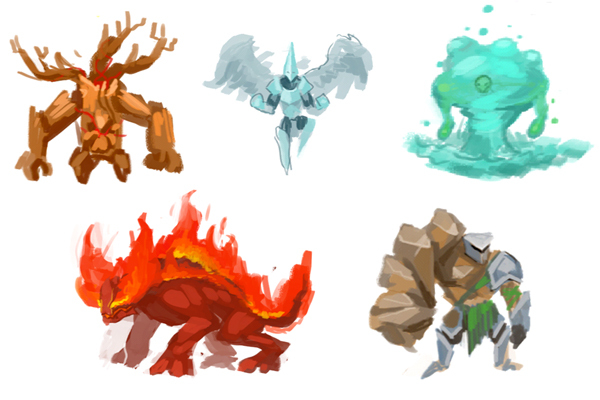 The monsters are also associated with specific elements, and gathering a party with appropriately varied skills will be an important goal with the more difficult game maps. Technically, the online play uses an optimised mix of peer-peer and client-server networking; I’m planning to write a blog post about this quite soon. 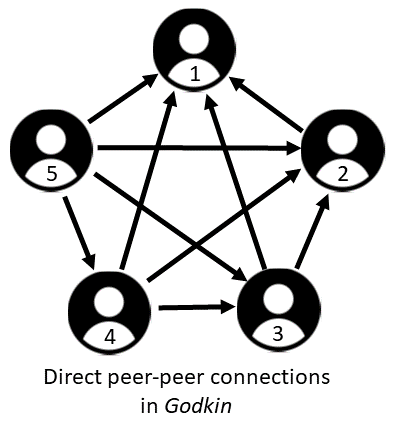 To win a game of Godkin, your team will have to balance attack and defence. You’ll have to track down and eliminate all of the monster camps on the map, while also overseeing the construction of walls, barricades and towers for the villages. As monsters approach the villages, your role will become that of field-captains: fighting, yes, but also marshalling and instructing the mortal characters who you are trying to save. Working as a team will be critical to achieving all of these simultaneous goals. The mortal characters in the game take the form of villagers and followers. Followers are essentially combatant villagers who have pledged themselves to your service, and who you can bring with you into different games. They level up and gain skills, leadership ability, and courage; however, they can die (permanently). You issue orders to followers – gathering resources, constructing defences, or joining you on at assault on the monster camps. However, you don’t directly control them – if you push them into too much danger, their courage might break and they will run away. Your followers, in turn, gather together villagers to assist them with their gathering and constructing. 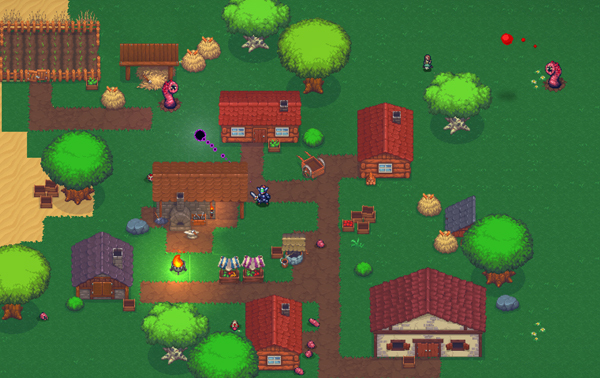 Godkin maps are procedurally generated – they include mountains, lakes, seas, forests, and villages – as well as caves and other areas which are not part of the core game win/lose conditions, but where random monsters can be found and rare loot gathered (treasure, magic weapons and armour). The difficulty of the map will be defined in terms of its monsters and resources – and as you get more experienced at the game you’ll unlock more and more challenging maps. We’re also going to include weekly challenge maps and high-scores – so teams can pit themselves against other teams playing the same map. I’m planning to write a blog post fairly soon about the procedural map generation used in Godkin. The Hub (located in the immortal realm) is where you meet other players, chat, and form teams. 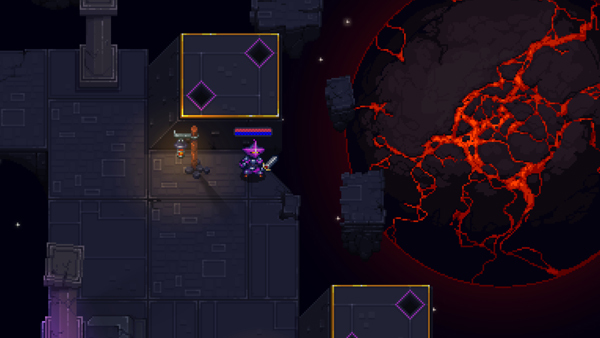 Lobbies (also in the immortal realm) are private platforms where a team readies itself for combat: choosing map parameters and selecting spells, equipment and followers. Godkin is being developed by the same team that made Goblins and Grottos, which we released in July 2016. 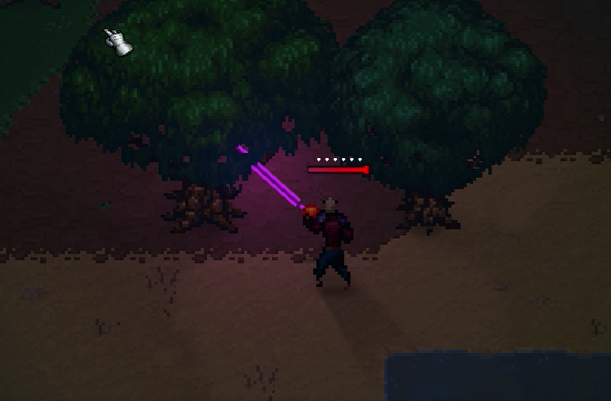 For the past few months, I have been working on Godkin, a pixel-art online co-op combat RPG. This is a collaboration between Psychic Software and Goblin Portal (our second collaboration, in fact, following up on last year’s release Goblins & Grottos). Godkin takes a “faked 3D” view (this style is often referred to as isometric, although actually we’re not adhering correctly to the strict viewpoint that would make the game isometric.) Getting the lighting and shadows looking good in this style is somewhat challenging, since there’s no real 3D geometry for the game engine to work with. I’m having a lot of fun programming this game in Unity (it’s my first Unity game) and figured a blog post about shadows and lights was in order! At the core of my shadowing system are the FakeShadowCaster and LightAnimator components. 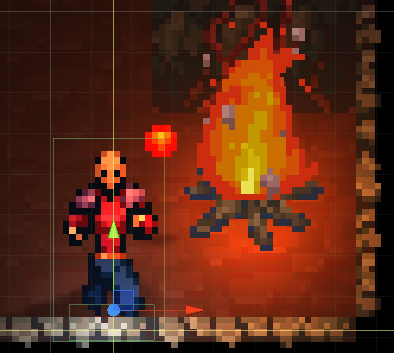 A LightAnimator component is attached to any objects that have lights – camp fires, torches, explosions, etc. These search for nearby objects which have FakeShadowCaster components, and register with them. They also notify the FakeShadowCaster objects whenever changes happen (e.g. the light moving, flickering, brightening, dimming, turning off). A FakeShadowCaster component is attached to any objects that we need to cast shadows – basically, anything that should appear to have some 3D ‘height’ – characters, monsters, rocks, trees. This component maintains a list of nearby light sources, and creates a fake shadow sprite to associate with each of them. Whenever a light notifies a change, or if the FakeShadowCaster itself moves, its list of shadows are re-calculated. Each shadow is rotated to face away from the associated light source, and its opacity is set based on distance from the light (plus other variables). I also wrote a ‘shadow skew’ shader which spreads apart the vertices of the shadow sprite which are further away from the light source – with a stronger effect the closer it is to the light; this adds quite well to the overall feeling of 3D. Another nice touch is that we can use whatever sprites we like for the shadows – so trees, for example, can have their shape baked into their file. 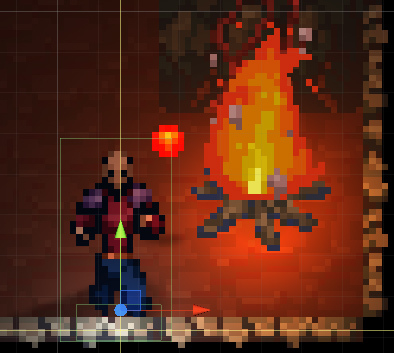 The standard Unity sprite shaders look great for terrain, and sprites which don’t have much ‘height’ – however, since the amount that each of their pixels is lit is simply based on the distance they are from light sources, this starts to look strange for objects that are supposed to be tall. The problem is that the top pixels and bottom pixels of the object will be at quite a different distance from the light – but to look like a proper object with height, the vertical position of all pixels should be considered the same, for lighting purposes. So here we have a shader that attentuates light to all pixels based on the position of the vertically lowest ones. This shader also reduces the brightness of any object which is in front of lights (since in this case the majority of the light should be cast on the non-visible ‘back’ of the objects). If you’d like to follow the progress of Godkin’s development, here’s our blog. Or why not join us for a chat in Discord?